The occasion demands something extraordinary, a Bearnaise sauce for your tournedos of beef perhaps. This small pan can play a critical role of your culinary success. Its wide top and sloping sides are perfect for creating spectacular sauces. The bestseller among All-Clad's renowned cookware collections, the Stainless line provides serious and professional cooks all the virtues that make All-Clad's worldwide reputation unsurpassed. Key to its high performance is a three-ply, bonded construction. Sandwiched between layers of stainless steel is a thick core of pure aluminum that spreads heat evenly across the bottoms of pots and pans and all the way up the sides. The interior is 18/10 highly polished stainless steel, so it's stick-resistant as well as stain- and corrosion-resistant. The exterior is gleaming, magnetic stainless steel that works on induction as well as conventional stovetops, and, with care, remains beautiful during this cookware's lifetime warranty against defects--and beyond. Each piece of All-Clad cookware features a unique metal bonding construction. All-Clad Stainless cookware sandwiches a thick core of three separate layers of aluminum between an easy-to-clean, highly polished 18/10 stainless-steel cooking surface and a magnetic stainless-steel exterior. The aluminum core retains heat and evenly distributes it along the bottom and up the sidewalls of the cookware. The stainless interior is stick-resistant and cleans easily. The magnetic stainless-steel exterior gives the cookware a gleaming finish. 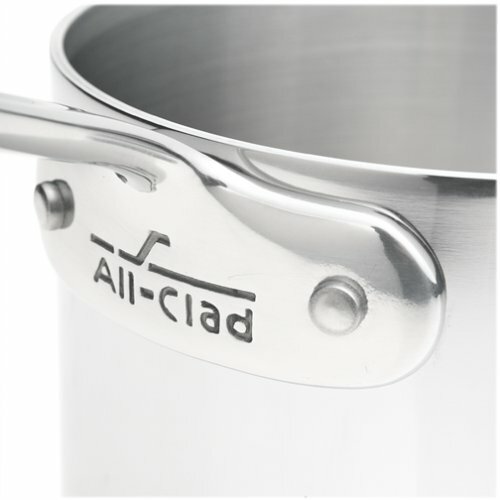 All-Clad Stainless also features the company¡¯s signature "stay-cool" long handles, lids fashioned from gleaming 18/10 stainless steel, and highly durable stainless-steel rivets. All-Clad Stainless cookware is one of five collections from All-Clad Metalcrafters. Designed to work on conventional gas and electric ranges, as well as induction cooktops, All-Clad Stainless cookware is the best-selling collection in a full line that includes All-Clad LTD, Cop-R-Chef, Master Chef 2, and Copper Core. Pure aluminum core that not only covers the bottom of the pan but also extends up the sides. This allows for great heat conductivity as well as an even heat distribution so you won¡¯t have "hot spots" when cooking. Polished stainless-steel lids fit evenly with the pan¡¯s edges to seal in flavor of your foods. For daily cleaning, warm soapy water is sufficient. Clean your All-Clad thoroughly after each use. Food films left of the pan may cause discoloration and sticking. To get rid of stuck-on food or discoloration and stains from using too high of a heat, we recommend cleaning your All-Clad with a product called Bar Keeper¡¯s Friend. To use the Bar Keeper¡¯s Friend, simply use a soft cloth or sponge and water and make into a soupy paste. This can be used on the interior, as well as the exterior of your All-Clad (excluding the Cop-R-Chef). The Bar Keeper¡¯s Friend can also be used on the exterior of the All-Clad Stainless collection, LTD collection, and MC2 collection. For cleaning of the Cop-R-Chef exterior, simply use a brass/copper cleaner. If your water has a high iron content, you may notice a rusty discoloration. Use Bar Keeper¡¯s Friend to remove it. In recent years, a professional-size 14-inch fry pan was added to the Stainless fry pan assortment, as well as several popular specialty pans, including: the small-size petite brasier with a dome-shaped lid; petite roti roasting pan; and the beautiful, large-capacity Dutch oven and French oven oval roasting pan with roasting rack. Both of these one-pot comfort food specialty pans comes with All-Clad¡¯s popular high dome-shaped lid. Other specialty pans include a larger brasier pan with domed-shape lid; a complete family of round-shaped saucier saucepans for versatile stove-top cooking; a flare-sided Windsor pan in two sizes, designed for reduction and the creation of rich sauces; and a contemporary "Soup for Two" 3-1/2-quart soup pot; casseroles; an open stir fry; a versatile wok-style chef¡¯s pan; and a "Pasta Pentola" 7-quart stockpot with colander insert and lid. All saucepans, casseroles, saut¨¦ pans, stock pots, and specialty items come with lids. Double boiler and steamer inserts, including the large steamer insert for 6-quart, 8-quart and 12-quart stockpots, are available as well. Stainless cookware sets are available in various sizes, from a starter 5-piece to a complete 10-piece set. Based in Canonsburg, Pennsylvania, All-Clad Metalcrafters markets premium quality cookware to department and specialty stores in the United States, along with premium All-Clad bonded bakeware, All-Clad All-Professional kitchen tools, and a growing assortment of kitchen accessories, including All-Clad¡¯s upscale tea kettle, measuring scoop set, stainless-steel mixing bowls, kitchen colanders, and 1-cup measuring cup. Featuring a unique metal bonding process, All-Clad cookware is used in many of the finest restaurants in America, and is sought by serious home cooks seeking all-professional cookware to enhance their cooking experience. Watch out for the tipping! I couldn't decide: the 3 quart saute, sauce, or saucier. Tradition said to stick with the saute. But I knew that I needed something with higher sides. A 3 quart saucepan? Who was I kidding? That's a monster. So, feeling like Goldilocks, I finally hit my "just right" option, the saucier. This is not a pan that is well known, but what's not to love? The high sides and beveled inside curve mean you can reduce and whisk and sauce to your heart's content without sticking. The large surface area of the bottom plate means you can saute and sear without worry of space constraints. And I haven't even mentioned how evenly it conducts heat, its well-balanced heft, or striking beauty on my pot rack. I'd coveted a friend's 3qt but didn't feel right buying a piece of cookware just because it was so lovely and well shaped. Luckily I received the 5.5 qt version as a present and at first I thought it would be impractical, I didn't need anything that large, but I was wrong. I like to braise meats which often means several steps of browning, then deglazing, then adding liquid and cooking in the stovetop or oven. I've got a large heavy enameled dutch oven that I used to use but it always felt clumsy sauteing with the steep sides, and it is heavy enough that moving it around is a chore. The 5.5 qt saucier is a much better fit for me. The smaller bottom and curved sides give me a more even hot area and easier access with utensils and because the heat comes up the sides it works like a good saute pan with a long handle. Then when it's time to work as a dutch oven it's deep enough to fill, drop the lid on, and move to a back burner or the oven. I appreciate that I can clean it with barkeeper's friend (not as easy as cast iron to clean but much less heavy) and then put it in the dishwasher for a final clean and sterilization. All Clad's quality speaks for itself. This saucier provides the same great heating AC is known for. I tend to reach for this during the holidays when I have to boil a lot of vegetables. I use it interchangably with the sauce pan because rarely do I make enough of a sauce to warrant this pot. I use this pan to reheat soup and make sauces for one. Sloped sides help evaporation. Even heating, heavy for it size. I love the fact I can put it in the dishwasher after I've made a sticky glaze.